A blister agent, or vesicant, is a chemical compound that causes severe pain on the skin, in the eyes, and in the mucus membranes. They can cause severe chemical burns, which then cause painful water blisters, on both the outside and the inside of the body. (This is why these chemicals are called "blister agents.") Throughout history, blister agents have been used for chemical warfare. Some blister agents are used to treat medical problems - for example, to remove warts. However, they must be used very carefully. If a person accidentally gets even a little bit of the chemical in their mouth, they can die. There are three major types of blister agents. Mustard agents are also called "sulfur mustards" or "mustard gas." They are a group of blister agents that have sulfur in them. When they are mixed with other chemicals to be used in chemical warfare, mustard agents are a yellowish-brown color, and smell like mustard plants. This is why they got the name "mustard agents." Throughout history, many different types and mixtures of sulfur mustards have been used. 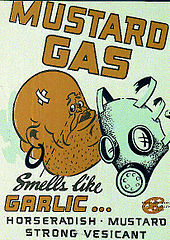 Mustard agents were first used as a chemical weapon by the German Army during World War I. More recently, in September 2015, the United States said that the terrorist group The Islamic State in Iraq and Syria (ISIS) was making and using sulfur mustard in Syria and Iraq. Nitrogen mustards are similar to sulfur mustards, but they have nitrogen in them instead of sulfur. While some countries stockpiled (gathered a lot of) nitrogen mustards during World War II, nitrogen mustards have never been used as chemical weapons. In fact, today, they are mainly used to treat medical problems. A few nitrogen mustards are too poisonous to be used for anything but chemical weapons. But many others are used as chemotherapy medications to treat cancer. Lewisite was first created in 1904. The United States experimented with using lewisite as a chemical weapon in the 1920s and during World War II. However, lewisite did not work well because it smelled like geraniums (a type of flower) and made people's eyes water. Enemy soldiers would smell the chemical and realize their eyes were watering, and would put on gas masks to protect themselves. In the 1940s, British scientists made an antidote to lewisite, called dimercaprol (or "British anti-Lewisite"). After this, lewisite was no longer as useful as other blister agents, and countries stopped using it. All blister agents easily enter the body through the eyes, lungs, and skin. Lewisite causes symptoms right away. However, mustard agents do not. When they are breathed in, symptoms usually do not appear for 4 to 6 hours. When mustard agents get on the skin, symptoms can take 2 to 48 hours to appear. ↑ 2.0 2.1 2.2 "Vesicant/Blister Agent Poisoning: Toxic Syndrome Description". CDC.gov. United States Centers for Disease Control and Prevention. April 5, 2013. Retrieved January 28, 2016. ↑ Paul Blake (11 September 2015). "US official: 'IS making and using chemical weapons in Iraq and Syria'". BBC. Retrieved 16 September 2015. ↑ Lizzie Dearden (11 September 2015). "Isis 'manufacturing and using chemical weapons' in Iraq and Syria, US official claims". The Independent. Retrieved 16 September 2015. ↑ "Facts About Nitrogen Mustards". CDC.gov. United States Centers for Disease Control and Prevention. April 4, 2013. Retrieved January 28, 2016. ↑ Stanford University School of Medicine (2013). "Topical Nitrogen Mustard (Mustargen)". stanford.edu. ↑ University of California, Los Angeles (2002). "Brassica alba or Sinapis nigra". ucla.edu. ↑ University of Durham. "SCHEDULE 1 CHEMICALS" (PDF). dur.ac.uk. ↑ Mattes WB, Hartley JA, et al. 1986. "DNA sequence selectivity of guanine–N7 alkylation by nitrogen mustards". Nucleic Acids Research 14 (7): 2971–2987. doi:10.1093/nar/14.7.2971. PMC 339715. PMID 3960738. ↑ Cheson BD, Rummel MJ 2009. "Bendamustine: rebirth of an old drug". Journal of Clinical Oncology 27 (9): 1492–501. doi:10.1200/JCO.2008.18.7252. PMID 19224851. http://www.jco.org/cgi/pmidlookup?view=long&pmid=19224851. ↑ 12.0 12.1 Vilensky, J. A. (2005). Dew of Death - The Story of Lewisite, America's World War I Weapon of Mass Destruction. Indiana University Press. ISBN 0253346126. ↑ "CDC - The Emergency Response Safety and Health Database: Blister Agent: LEWISITE (L) - NIOSH". www.cdc.gov. Retrieved 2016-01-14. This page was last changed on 20 June 2018, at 02:17.